Jesus claimed to be God. ..Wow, those are some BIG shoes to fill. This Sunday we share an Easter message about God’s irrational, inexplicable love for misfits, how the most irresistible Message in the world can be eclipsed and His unending, unfathomable kindness in our repeated failures. 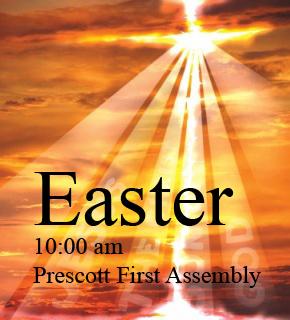 Cannot wait to celebrate this Easter this Sunday. One of my most favorite times of the year is Palm Sunday. I love the feeling of celebration and anticipation of some thing new just around the corner. I love the sense in my spirit of new life and new beginnings. I love the way families get together and come to worship in a church with other believers. I love the history and tradition of a day of worship that speaks so powerfully of a loving, involved Heavenly Father in our everyday lives. I love the way Palm Sunday helps me realize I am living in the here and now but someday I will experience the then and there ….Yes, the drumbeat of eternity become more real, more amplified more visual to me on Palm Sunday. I love the way Palm Sunday sets me up in preparation for that epic day half the world celebrates – Yes, Easter means eternal life is possible, reachable and the gates of new life are actually mine to enjoy. 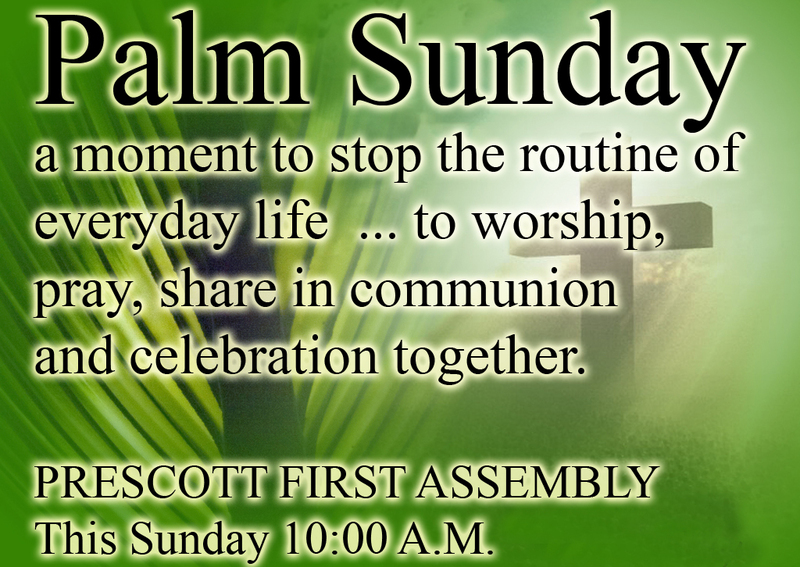 I love Palm Sunday – get up get out to a worship center somewhere and love it for yourself tomorrow. 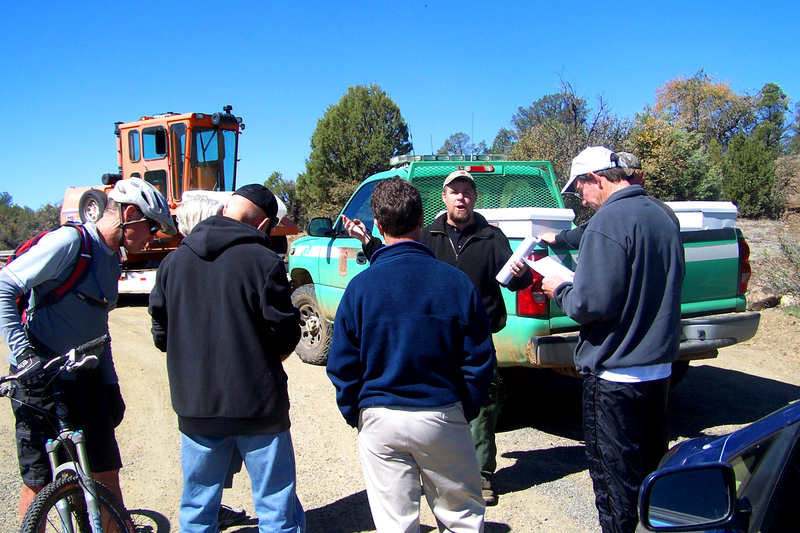 Last Tuesday morning a group of us met with Casey and Corey from the Prescott National Forest to discuss the hazardous fuels mitigation work that will begin in the Iron Springs/Emmanuel Pines section of the PNF. The gathering between the PNF and trail users was very positive and the questions were direct and the response was good. The PNF is mitigating or brushing the forest to attempt to clean out the under brush in order to lessen the chance of another major forest fire in our area. (Thumbs up on that). Our concern is that in the process of brushing many of our trails used by various interest groups become less than desirable after the brushing is completed. Local mountain biker Nathan Herring put into words just how important the Iron Springs/Emmanuel Pines area is to all of us. “Even though the trails in the pines are social trails, they do have a positive impact for the forest eco-system. With these trails being very popular among the locals, the human impact (bikers, equine, etc.) is spread out from the common areas such as Thumb Butte and Granite Mountain, which results in less damage to the overall eco-system. 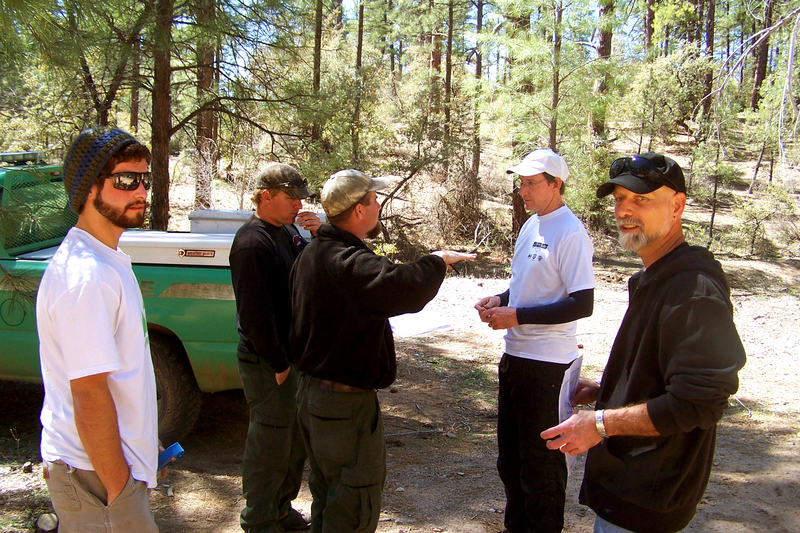 The forest leadership agreed that they can “tone down” the process in the following ways. – Making the contractors that are doing the work aware of the concern by the community. – Leaving larger patches of the “mosaic” cuts along the trails both social and numbered. – Making trail users aware of the need to stay clear of the brushing machines for safety reasons. 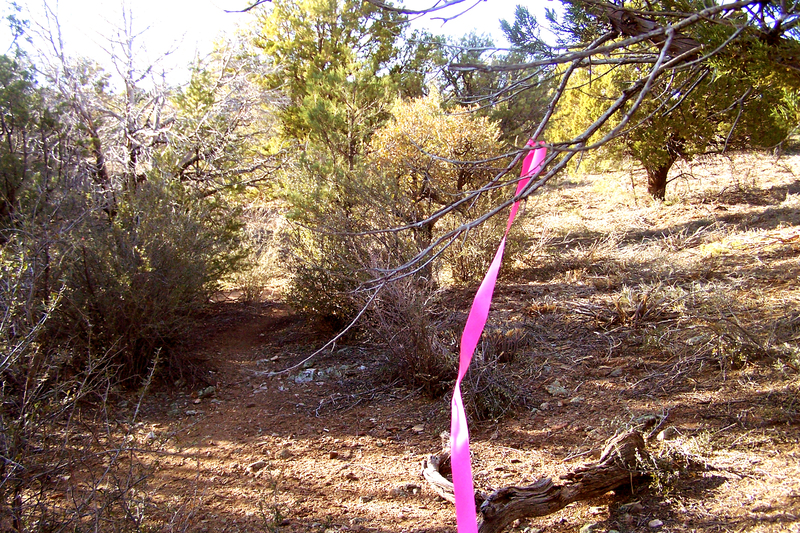 – Placement of a BLUE INDICATOR RIBBON along trails that the trail users would like to see more “sensitivity” or “less brushing” to allow for a “distinction” between the trail and the brushed areas. – Make the public aware of the “ribbon placement” importance in the brushing areas. 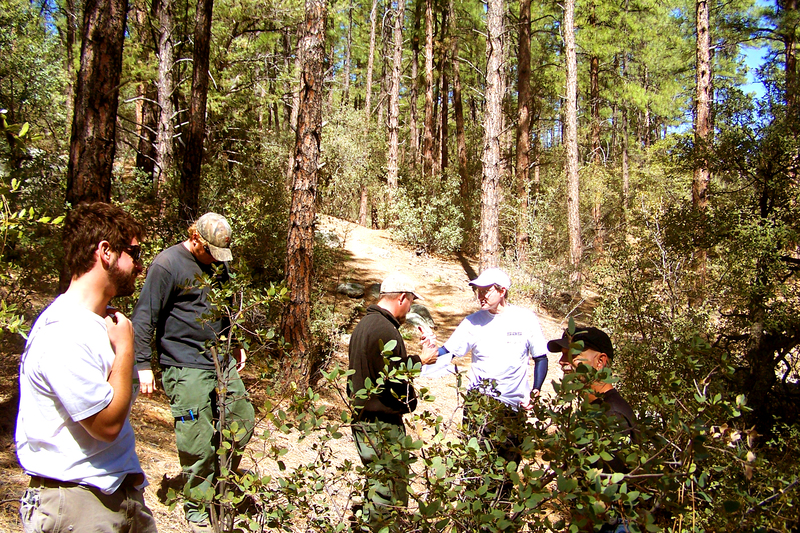 This point is KEY for trail users during forest brushing seasons. So here is a bit of info. that can help. There are three colors of ribbon being used in the PNF to help communicate to the brushing workers as to what to clear and what not to clear. RED ribbon means do not brush this area. WHITE ribbon means do not brush this area because of sensitivity or historical interest. 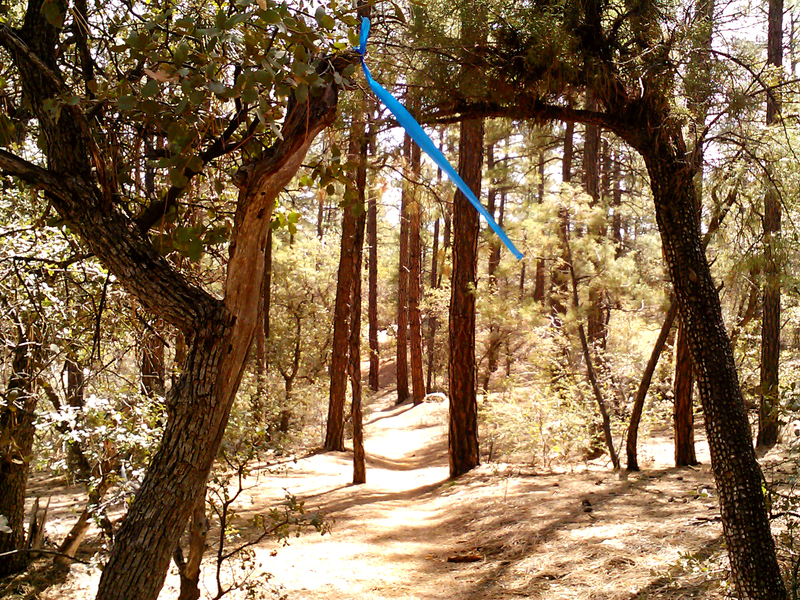 BLUE ribbon means take it easy or tone it down with this section of trail. Part of the problem the PNF has been having is that they will but up the indicator ribbons in the forest and a week later they are missing or taken down thus making it impossible for the brushing crews to know were to stop brushing. 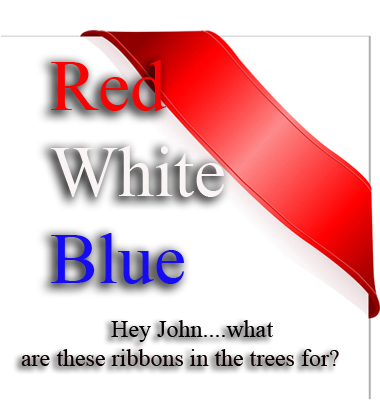 So, lets get the word out to leave the ribbon that is hanging from the trees. When the ribbon is taken off the trees it just makes our cause to preserve the area more difficult for everyone involved. If you notice someone removing the ribbons maybe explain to them the process or if they continue to remove ribbons you can call the PNF dispatch @ 777-5700. Hopefully the conversation with the PNF will help and they can do the necessary work while keeping some of the trails enjoyable for the next few years until the plants begin to sprout back again. It is a general fact that when it comes to word budgets the average guy speaks 2,000 to 4,000 words a day and the average woman 6,000 to 8,000. Interesting that there is no law (yet) that governs how many words we are allowed to speak in a day. What would happen if we toned down the talkativeness just for a few moments of our day? 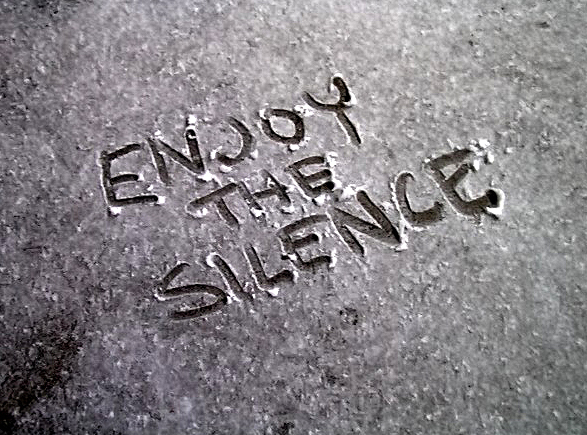 Could it be that the lost art of the “vow of silence” could help heal the hurts we think we have to talk about everyday? A monastery in Missouri had this inscription above the entry: “an unguarded tongue dissipates the soul”. Ummm, could “momentary vows of silence” during your day give you the power over negative attitudes and controlling thought patterns that wear us out everyday. What could possibly be wrong with disciplining ourselves to not speak about every emotion that comes over us. 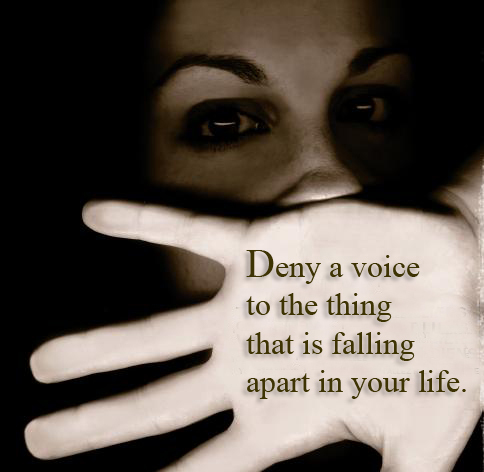 – Deny a voice to the things that are falling apart in your life. – Mute the habit of rehearsing negative self feedback you talk about everyday. – Starve out toxic words by giving yourself permission to not speak about them for a change. – Allow a peace that passes our limited understanding to invade the space that once was reserved for turmoil, anguish and anger. Instead of feeling like we have to always give a verbal response to everything thing and everyone, sometimes it does your soul good to just smile and nod. 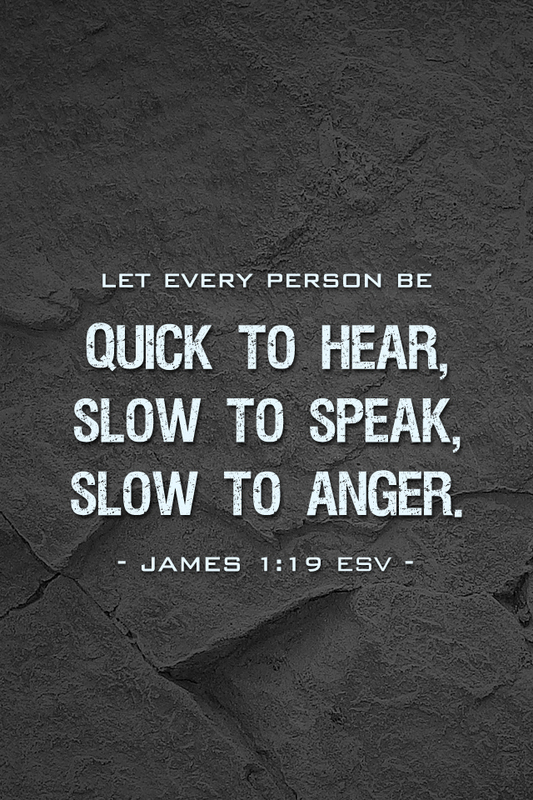 Being slow to speak and slow to become angry does start a domino effect inside us. It is so true that the emotion of tiring anger is closely linked to what we speak. Give yourself permission to have the pleasure of not speaking. – Try it for a day and see what happens when you chose to not give a voice to certain things that are wearing you out from the inside. 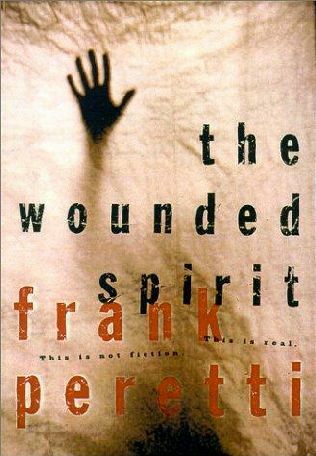 DO YOU SUFFER FROM A WOUNDED SPIRIT? Here is a quick excerpt from the message “walking in a wounded man’s shoes” this Sunday. It is just a partial slice of the message . How do you know when you have a wounded spirit? – Here are just a few symptoms that are tell tale signs that you are walking around in a wounded man’s shoes. 1. A negative mind-set. The person with a wounded spirit is preoccupied with past injuries. He views incidents in life in the worst light. He sees the bad and ignores the good. His mind is filled with woes, suspicion, and assumption of evil. 2. Victim reasoning. With a wounded spirit, a person views himself as a sufferer. He can turn even kind actions of others into additional grievances, into added pain in his life. He is pleased when others notice his misery, and hurt when they do not. 3. Grievance mannerisms. Out of a wounded spirit come sighs, groans, and exclamations that draw attention to the hurt. There is body language such as shaking the head, throwing dark looks, facial misery, and slumped shoulders. 4. Blame tactics. A person with a wounded spirit holds other people responsible for the misery in his life. In truth, others may have done him wrong, but those wrongs become the means of blaming others. The wounded spirit is able to cough up old injuries no matter what the present subject. The stories that are told put others in the worst light. In addition to direct blame, there are ways of insinuating–giving details in such a way that worse is implied. Out of the wound oozes the stench of self-pity, bitterness, and accusation. 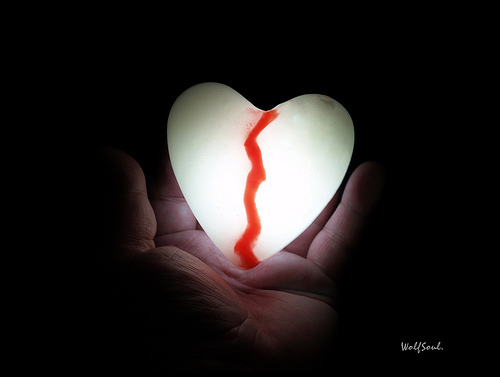 I realize being a person who has been wounded hurts deeply and can be very painful. It does take some time and friends with gracious spirits to help us out of the depths of the wounded spirit life. That is why Jesus (an amazing gracious friend) was “wounded for our transgressions and he was bruised for our iniquities.” Isaiah 53:5. Frank Draws from news stories and his own childhood spent fighting the pain of a disfigurement that made him an object of ridicule to illustrate the effects of emotional scars, and offers ways to overcome abuse. I would like to close this blog by giving one of my favorites quotes from author and pastor Rob Bell. 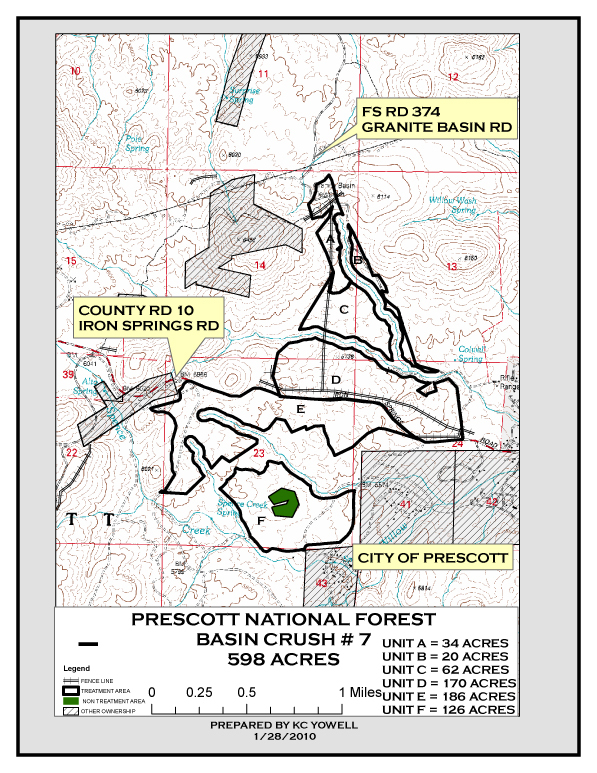 This Tuesday morning we have an opportunity to meet with Forest Fuels Specialist Aaron Hulburd of the Prescott national Forest regarding the mitigation of hazardous fuels in the Iron Spring/ Emmanuel Pines area. If you have questions, comments or concerns regarding this process you will want to be at this gathering with Aaron. We will meet at the Iron Springs/Granite Basin parking lot at 10:00 AM on the 12th of April. The article link will help you gather a greater understanding of this process before our info. meeting. Also, here is a link to a blog I wrote a week or so ago regarding this work. Hope to see you there with some positive helpful feedback. 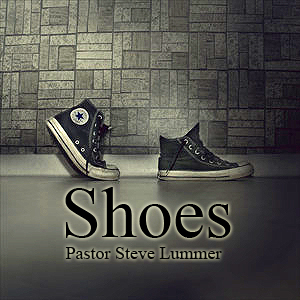 We are continuing our SHOES series this Sunday.